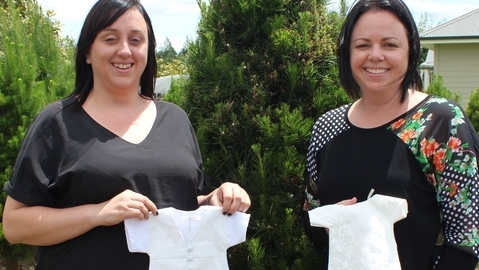 When Hamilton midwife Kirstin Rouse launched Angel Gowns 18 months ago, she had no idea the service turning wedding dresses into gowns for stillborn babies and babies who die in early infancy would be so popular. Or how much it would cost her financially. But the woman who suggested Kirstin launch Angel Gowns is now helping Kirstin with those costs. Cassie Emmett and Kirstin met through their work - Cassie is a birth photographer - and it was Cassie who heard about another angel gown service and suggested Kirstin could do the same here in New Zealand. While Kirstin has recruited a team of about 100 people around the country who deconstruct the wedding gowns and turn them into tiny gowns for the babies, she pays for the substantial postage costs out of her own pocket. Every gown she posts costs $9 and she includes a pre-paid pack so the sewer can return the angel gowns. Kirstin then sends out bulk lots of gowns to hospitals around the country where they are distributed to bereaved families. Kirstin hasn't kept track of how much the postage costs her, but estimates it's thousands of dollars. However, Cassie and her family hope to give Kirstin a "sizeable cheque" to help with the postage costs. The family lives on a lifestyle block just south of Hamilton. They used to run sheep on their land but Cassie hated killing them and so they've planted the land with pine trees to sell this Christmas. Regardless of size, each tree is priced at $20 and the Emmett family will give $1 from each tree sale to Kirstin. Cassie estimates there are 1200-1500 trees for sale so if they all sell, that'll go a fair way to helping Kirstin with postage costs. Kirstin has been inundated with wedding gowns to the point where she has run out of room to store them all so has asked for donations of dresses to go on hold for awhile. The Emmett's Christmas tree farm - Pines and Needles - will open for business from tomorrow and will be open weekends from 9am-8pm and weekdays from 5-8pm until the trees have sold out. They are taking cash and eftpos payments. The farm is located at 12 Middle Rd, off Raynes Rd. For more information see www.facebook.com/PinesandNeedlesChristmasTreeFarm.